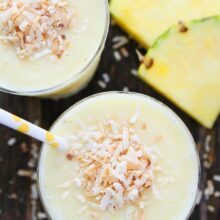 Pineapple Coconut Smoothie-this simple and healthy smoothie will transport you to a tropical island! Last week we partnered with American Express and Hilton HHonors for a trip to the Waldorf Astoria resort on Maui, and we miss it! Why can’t every week be vacation? We loved the beach life and have had a hard time getting back to real life. The boys are still on Hawaii time, a four-hour difference, and they miss swimming, playing in the sand, and fresh pineapple. We ate fresh pineapple every single day. Hawaii pineapple is the best! To cheer my boys up, I made them Pineapple Coconut Smoothies yesterday. I brought a little bit of Hawaii into our home! This smoothie is easy to blend up! 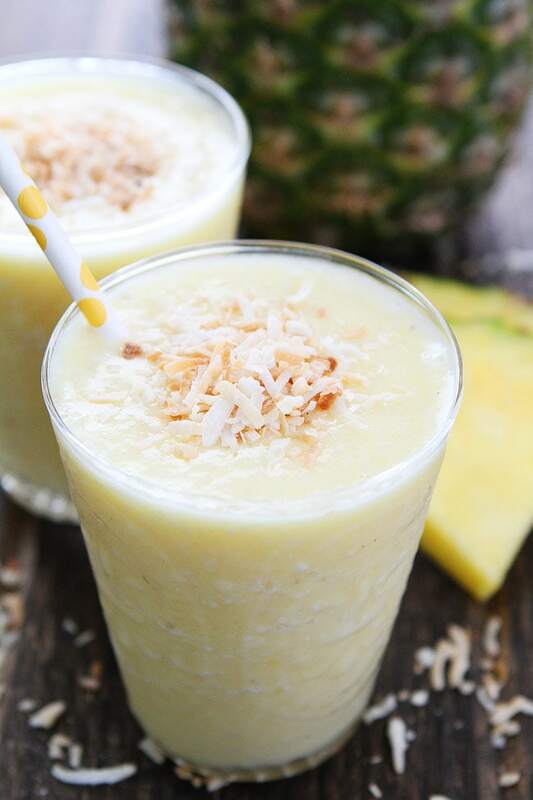 Combine fresh pineapple, coconut milk, yogurt, coconut, and ice in a blender and blend until smooth. 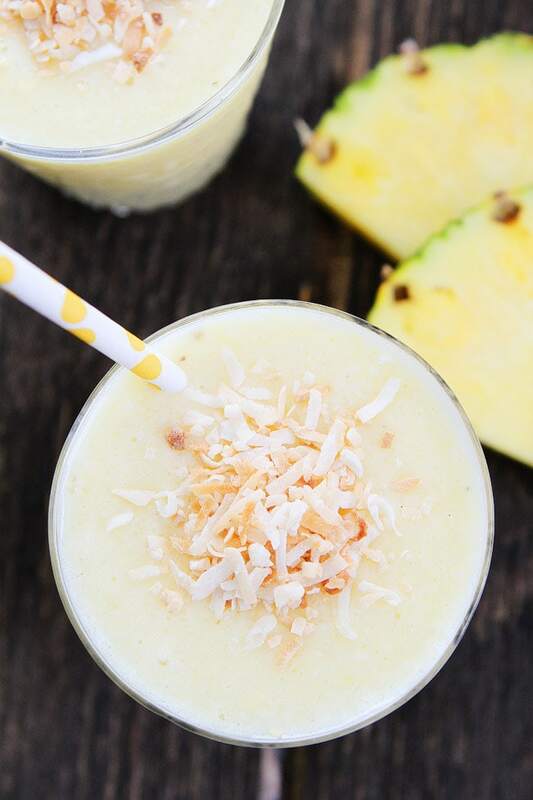 Pour the smoothie into glasses, garnish with toasted coconut, and enjoy! Caleb and Maxwell loved their Pineapple Coconut Smoothies. They still miss the beach, but the smoothies helped cure our post vacation blues! 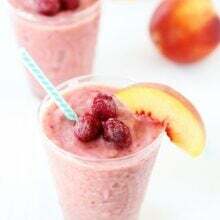 We used our new Hilton HHonors Credit Card from American Express at our recent trip to the grocery store (where I purchased ingredients for this smoothie among other items) to help fund our amazing Hawaii trip. By using our HHonors Card for our trip expenses (rental car, gas, food, restaurants, accommodations, trip activities, etc.) and much of our everyday purchases, we were able to meet the spend requirement and earn the Hilton HHonors Bonus Points towards a future trip! If you use your card at restaurants, supermarkets, or gas stations (all within the U.S.), you can get 5X the Points. Within the HHonors program, there are more than 4,600 hotels and resorts to choose from! Visit this website to explore how to use your points. Members can redeem their Points for free nights, premium merchandise, charitable contributions, or unique events through the HHonors auction platform (hhonors.com/auctions). There are lots of options! Hilton HHonors members who book directly with Hilton save time and money and gain instant access to the benefits they care about most like an exclusive member discount, free Wi-Fi and the ability to earn HHonors Points, which I can maximize by charging all my expenses on my Hilton Amex. We will share a recap of our Maui trip soon! We had a great trip and can’t wait to share it with you! 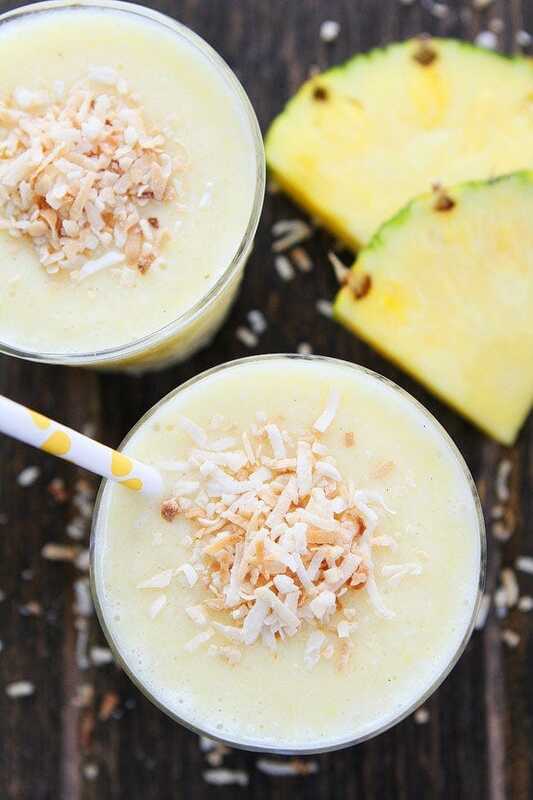 And make sure you try a Pineapple Coconut Smoothie, you will be transported to a tropical island after one sip! 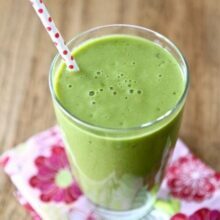 This simple and healthy smoothie is great for breakfast or snack time! 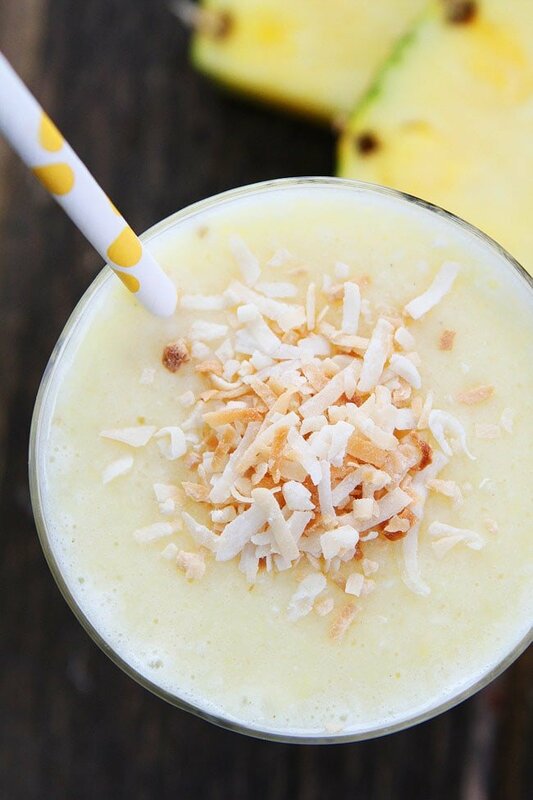 Combine the pineapple, coconut milk, yogurt, coconut, and ice in a blender. Blend until smooth. Pour smoothie into two glasses and garnish with toasted coconut, if using. Serve immediately. This post is sponsored by American Express, but our opinions are our own. Thank you for supporting the brands that continue to make Two Peas and Their Pod possible. Adding this to my list to try immediately! This smoothie!! I can’t wait to try it for my boys. And can’t wait to see the Maui pics! I could use a trip to Hawaii, even if it is only in my imagination! These look delicious! This sounds delicious and perfect for summer! My husband is a huge pineapple lover! I just cut up a pineapple for him last night! Perfect timing to make this creamy tropical smoothie with breakfast tomorrow. Thanks for the recipe! Looks delicious and coconut is my favorite next to avocado. I’ll be trying this one soon. 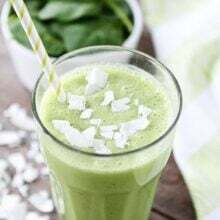 Hi,i am going to make your pineapple coconut smoothie soon but i was wondering how i can make your smoothie for 1 person. My name is kim and i have a magic bullet blender for 1 person to use at a time.i make healthy smoothies in my blender,i am a diabetic and i am lactose intolerant so i use lactose free and no sugar added ingredients in my smoothies,like plain yogurt,protein powder,stevia liquid or powder,coconut milk,cashew milk,almond milk and or natrel milk with a 1/4 cup of fruit fresh or frozen and four or five pieces of banana that has brown spots on the peel,which i peel and cut up a whole banana and then freeze it in a ziplock bag. 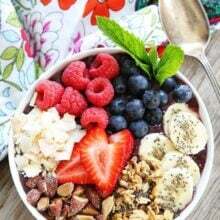 I can’t use a whole banana in my smoothies and i use a measuring cup to put frozen or fresh fruit in my smoothies.i can’t put a large amount of bananas or fruit in my smoothies because my blood sugar goes up high which isn’t good.i am on insulin twice a day nd i do my blood sugar test three times a day unless i am sick then i have to use more insulin and check my blood sugar more often.